Higher levels of government expenditures and more regulation naturally invite corruption, because they provide the opportunity for government officials to be paid off for regulatory favors, subsidies, and government contracts. Some countries have relatively large governments but lower levels of corruption. Scandinavian countries offer examples. While institutional differences may explain some of the cross-country differences in corruption, the most consistent relationship is that high levels of regulation are associated with more corruption. When looking at the effect of the size of government, it is the regulatory state, rather than the productive or redistributive state, that is associated with corruption. The authors gratefully acknowledge the helpful comments from Russell Sobel, two referees, and the journal’s editor. Marshall, M. G., & Jaggers, K. (2005). 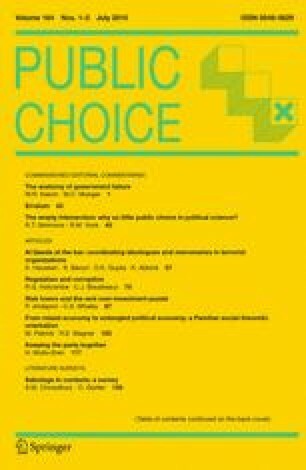 Polity IV project: Political regime characteristics and transitions, 1800–2002. http://www.systemicpeace.org/inscrdata.html. Accessed 4 June 2015.